Although it is preventable, tooth decay is the most common chronic illness that American children face—even more so than asthma. In fact, it is estimated that 40% of children will have had at least one cavity by the time they start kindergarten. While brushing, flossing, and routine care from their dentist are vital to protecting their teeth from decay, it may not be enough. You can help to strengthen your child’s enamel to ward off cavities with a fluoride treatment in Oklahoma City. Fluoride occurs naturally in the environment. Due to its benefits, it is often referred to as “nature’s cavity fighter” because it can help to reduce tooth decay by 95% when combined with dental sealants. It acts as a shield against the acids that can eat away at your child’s enamel. Your dentist can easily provide a fluoride treatment at your child’s next preventive appointment. It involves applying a varnish to their teeth, which helps to replenish lost enamel. This helps to keep their teeth strong and healthy to prevent cavities. Not only can it stop new ones from forming, but it has also been found to help treat areas of weakened enamel, stopping a cavity from forming. Although you may have heard some concerning discussions about its use, such as the development of white spots, when applied by their dentist, you have nothing to fear. In fact, the American Academy of Pediatric Dentistry supports its use to help reduce the risk of tooth decay in children. When the right home oral hygiene habits are combined with regular dental care and fluoride treatments, you can significantly decrease your child’s risk of tooth decay. In just a couple of minutes, you will give them an added layer of protection to keep their teeth strong and healthy. Ask their dentist about the benefits of fluoride today! Dr. Colin Holman is committed to providing the community with comprehensive dental care. With a focus on prevention, he offers the services that are necessary to keep your family’s teeth and gums healthy. 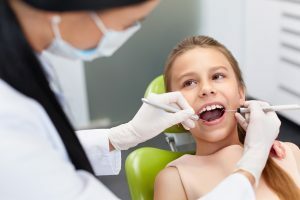 In addition to cleanings and checkups, he provides other areas of prevention as well, including fluoride treatments and dental sealants. To protect your family’s smiles, contact OK Dental Expressions today!